A New York-based premium eyewear brand, known for its signature hinge and for outfitting some of the city’s most iconic personalities. CHALLENGE. The brand perception shifted and was seen as too mature, too exclusive and too often associated with its founder. SOLUTION. We repositioned Robert Marc as a lifestyle brand, appealing to a younger audience and established a clear and consistent brand image that goes beyond its founder. 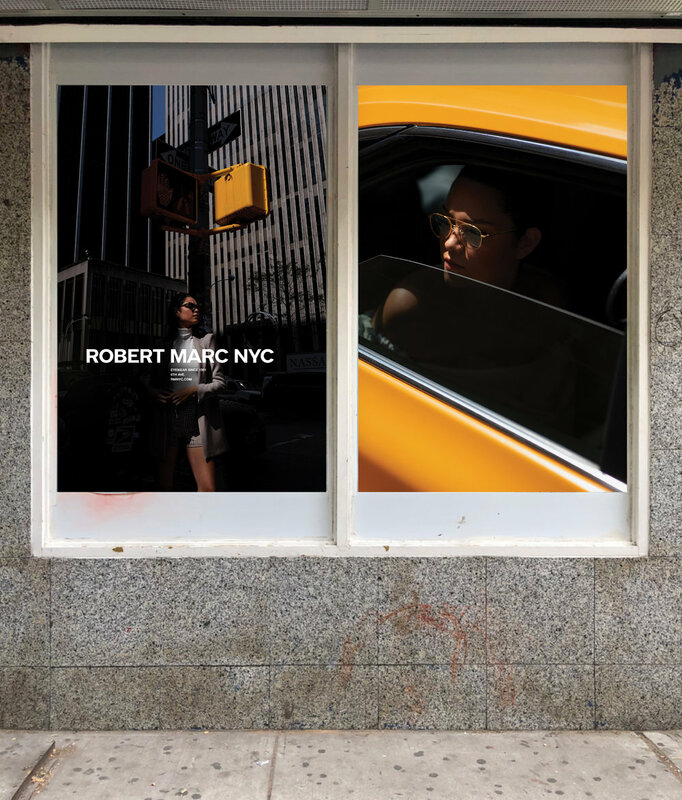 We chose to leverage the brand’s NYC roots to craft its new story and transform Robert Marc into an icon of New York premium eyewear. AWARDS. 2018 Silver Indigo Design Awards for Branding. 2018 American Graphic Awards. TEAM. Creative Direction by Pierre Delebois at forceMAJEURE Design. New York City in the 1980’s was bustling with energy and creativity after near bankruptcy. Artists, designers, musicians, writers and well-known denizens restlessly roamed the fashionable urban streets. ROBERT MARC NYC saw an opportunity to make a name for itself and opened its first boutique on Columbus Avenue in 1981. Quickly recognized for its unique ability to bring both comfort and fashion to the eyewear industry, the brand decided to launch its first collection in 1999. Influenced by New York City and classic French savoir-faire, the true beauty of ROBERT MARC NYC frames is the marriage of style and fit. We take pride in every detail of our frames, harmonizing premium materials and unique color combinations to create timeless eyewear. Our hinge is our trademark: inspired by historical design and construction. Informed by decades of expertise. Fundamental to making our frames distinctively ROBERT MARC NYC. RMNYC. Handmade by artisans from around the world.